Our training is proven in proactive, research based, practical, and easy to implement. We provide flexibility to best meet the needs unique to your campus. Participants will learn techniques to meet students where they are and lead them to where they need to be, capture attention, promote deeper learning, and engage students’ emotion. Clarify your understanding of what differentiated instruction is and isn’t. 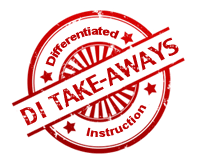 Learn the pillars of differentiated instruction. Assess which components of student engagement and motivation would be most valuable to focus upon. Understand how multiple intelligences and learning modalities impact student engagement. Explore ways to bring more of yourself into the classroom. Use movement to stimulate positive affect and deepen understanding. Learn fun strategies to ask for and respond to student feedback. Keep students on their toes with a variety of randomization techniques. Capture students’ attention and lead them to deeper levels of understanding through specific questioning techniques. Rediscover storytelling as a way to draw students into learning. Guide students to make personal connections to key concepts. Use a fresh approach to visual images to stimulate interest and engagement. Encourage input from everyone with brainstorming. Prepare kids to respond on demand and under pressure. Learn safe, fun ways for students to show what they know. Reach students you’ve never reached before. Facilitate deeper levels of understanding and learning. Be better equipped to recognize and respond to individual needs and interests. Collaborate with your colleagues to enhance your learning and teaching effectiveness. Have more fun with your teaching! If schools were permitted to have just one training, this is the one! This training will help to raise test scores for your students, decrease discipline challenges, and improve classroom rapport. You will learn how to meet students where they are and lead them where they need to be, capture attention, and promote deeper learning. © 2019 Cyndee's Teacher Training. All rights reserved.